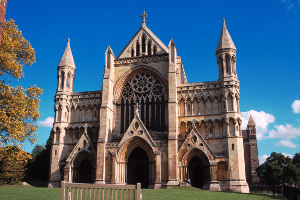 At St. Albans Abbey in Hertfordshire barons and clergy met in 1213 to demand payment from King John for past grievances. 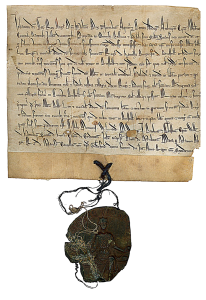 This led to demands for general rights and privileges based on past royal charters. 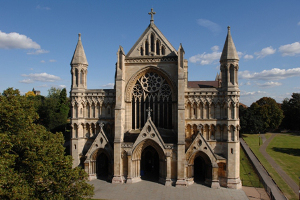 The Cathedral and Abbey will stage a range of Magna Carta events between 2013 and 2015. 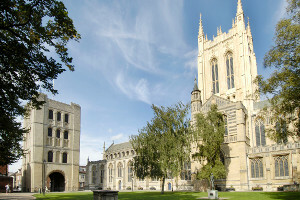 At the High Altar of the Abbey in Bury St. Edmunds (90 minutes from St. Albans), the barons reputedly met on St Edmund’s Day – 20th November 1214 – to swear an oath of allegiance to each other to force King John to accept the Charter of Liberties, the immediate precursor to Magna Carta. The remains of the abbey are visible today in the Abbey Gardens. St. Edmundsbury Cathedral, with its recently completed Tower is located in the precincts of the abbey. Facsimiles of the barons’ shields can be seen in the Cathedral. 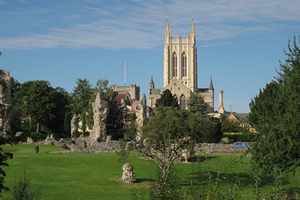 The Abbey of St Edmundsbury was one of the most important in the land and received many visits from Kings making pilgrimages all through the middle ages. A light and sound event will be held in October 2014 as well as other events through the year. Take a walking tour of St. Albans and visit Verulamium Museum displaying the life and times of a major Roman city. Drop by Huntingfield village in Suffolk; Baron de Huntingfield was one of 25 Barons to act as surety to Magna Carta.